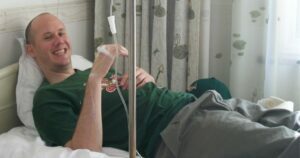 In 2011 an Ataxia patient named Riaan Van Der Merwe underwent stem cell therapy with us in China. The results were astounding. In 2015 however, his condition is relapsing and he is now hoping to undergo high-dose stem cell therapy in Thailand. As we know, Ataxia is a progressive condition which attacks the nervous system and may lead to symptoms such as poor coordination, unsteady walking and a tendency to stumble, difficulty with fine motor tasks such as eating, writing or buttoning a shirt, a change in speech, involuntary back-and-forth eye movements known as nystagmus, and difficulty swallowing. Prior to stem cell treatment Riaan’s symptoms included severe motor dysfunction which severely limited his fine and general motor skills, speech, and made daily life difficult. Things such as showering and basic chores became struggles as his balance and muscle strength were greatly affected. In the video below which was made by Riaan and his family, we can see his condition before therapy, his incredible results after the stem cell injections and physical therapy, and then the eventual decline in his condition as his Ataxia progresses. His initial stem cell treatment was a great success that improved his quality of life for nearly 3 years. We have seen that many degenerative conditions can be slowed with stem cell treatment, and this was the reason behind Beike Biotechnology’s new high-dose stem cell treatment protocol which allows patients a cheaper and more regular option to combat these chronic conditions. If you or a loved one is suffering from Ataxia please inquire with our medical staff to receive a free Ataxia stem cell treatment consultation. Riaan is now asking for your help to again slow his condition and bring back the quality of life he once had. To learn more about Riaan, his condition, and how you can help, please visit his site. please visit his site. If you or a loved one is seeking a treatment option for Ataxia please inquire below.